Our Border Soil is a bulk bag of peat free, rich black soil that has been blended with our high quality compost to create a fine, friable, rich loam soil, perfect for your plants. All our soils are screened to 10mm. Coverage: Each Border Bulk Bag will cover approximately 30 sq metres to a depth of one inch. "Fab service and delivery company were also friendly and helpful. " 15th April 2019 - Karl Greenwood , Liverpool . "Best top soil our gardener has seen, he will be recommending to all of his clients. " 8th April 2019 - Paula, Somerset. 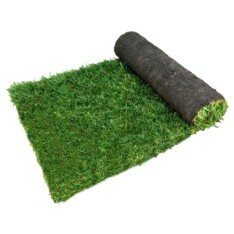 Stadium Turf A blend of five different species of grass to provide a lush, deep green turf. Stadium is a classic, hard wearing domestic lawn.